In the installation of stained glass ceilings, there is no need to prepare the original overlappings, which greatly simplifies the design process itself. It is worth noting that the process of installing stained glass suspended ceilings, which depends on the complexity of the layout and configuration of the room, takes significantly less time, compared with the traditional ceiling finishes. 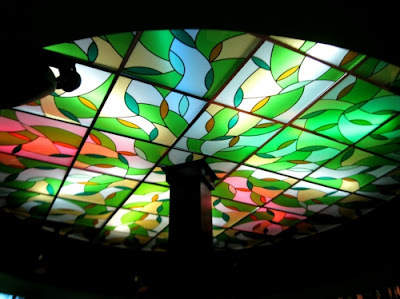 Stained-glass suspended ceiling designs can be the most diverse, are very practical, since if any element is damaged, there is no need to dismantle the entire structure. 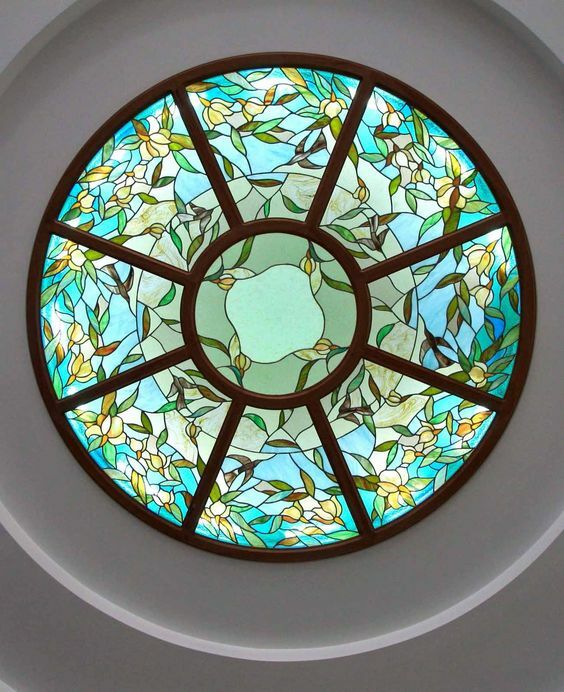 Stained glass panels for false ceilings consists of environmentally friendly materials and does not emit harmful substances so it can be installed in an enclosed room. 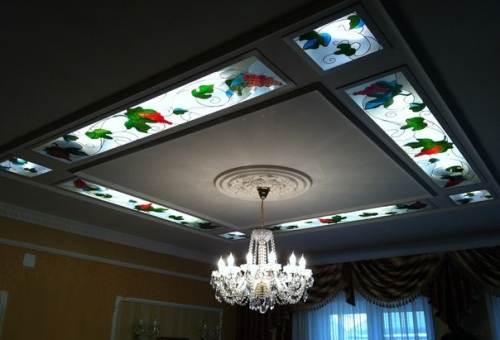 With proper installation, the stained-glass ceiling designs have a high moisture resistance. 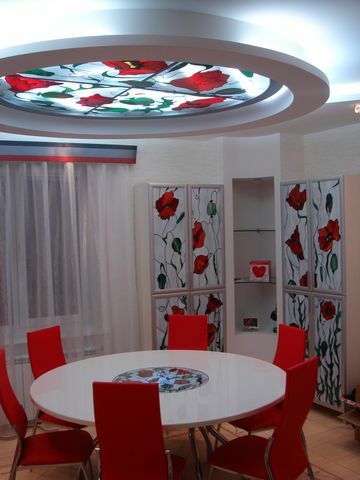 Today, a very large selection of stained-glass panels for suspended ceilings, differing in size, ornamentation, color, so everyone can choose exactly the option that fits perfectly into the interior of the apartment. film; collected from different glass elements. Film stained glass consists of two layers: a glass plate and a polymer film with a pattern. This type of stained glass panels is more economical, but less durable since the film is easy to be damaged. But, if to such a stained-glass ceiling is treated with high care and frugality, then it can serve you for quite a long time. false ceiling designs are perfectly arranged both in exhibition halls, in banquet halls, in clubs, and in apartments, houses, and restaurants. 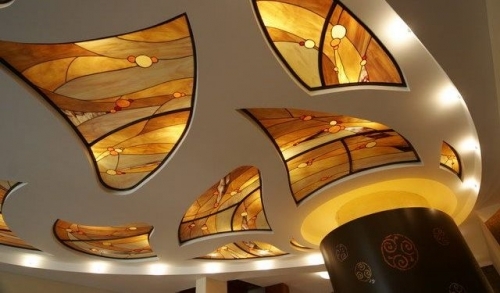 Today, there is a large number of technologies for manufacturing false ceilings of stained glass, allowing you to create a variety of design solutions. Consider the most popular of them. The sandblasted stained glass is a frosted glass with a printed image. Matting is performed by supplying a jet of compressed air to the surface. In the places of repeated processing, the plates are changed by the roughness and shade, or, more precisely, by the matt ones. Using stencils in the same way on the glass, you can apply a variety of matte patterns or transparent images on a matte background. 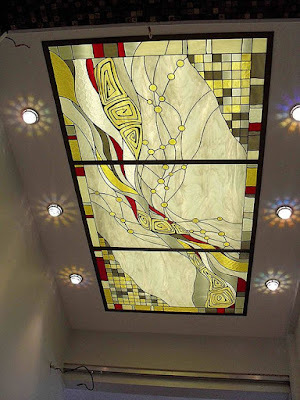 With the help of this technique, you can create non-divided artistic compositions, and in combination with decorative lighting, your stained-glass ceiling will attract everyone's eyes. 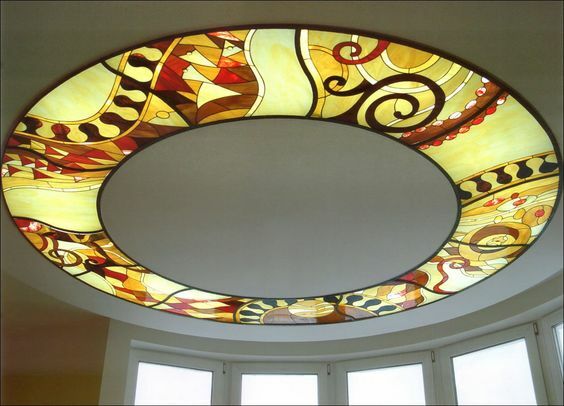 Photo printing on stained glass ceiling panels is a relatively new design solution, with which you can embody the most diverse bold plans: a photo, a picture or some kind of ornament. 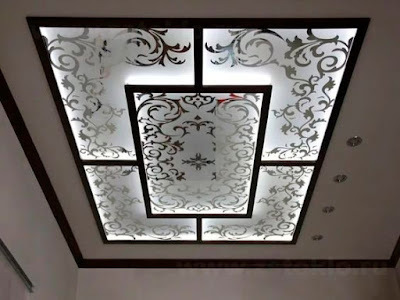 In order to produce photo printing on the stained glass ceiling, for beginners, the chosen treatment option, for example, a photo, on a special polymer film, should be applied. Further, this film with the finished image is divided into squares and applied to the ceiling glass. Designers developing contoured ceilings, primarily inspired by the flooded stained-glass windows, which were very popular in ancient times. To create contoured stained glass ceilings on the glass, it is first necessary to apply polymer beads according to the previously prepared plan. They can have a colorless, black, silvery or golden hue. Then varnishes or enamels are applied between the polymers. They can be of a variety of colors so you can make an unusual and original composition come true. Tiffany's stained glass suspended ceilings include a variety of glass elements, which are wrapped around the sides with copper or tin foil. This technique allows you to make not only a horizontal stained glass ceiling but also a domed one. In addition, in a single composition, you can use matte, transparent or relief glass, which allows you to create a unique interior in the house. 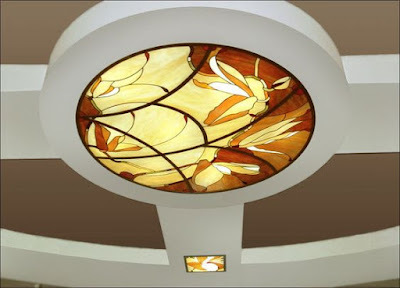 Ceiling stained-glass windows refer to the type of suspended ceilings and panels made of glass. On the glass, you can apply absolutely any picture. 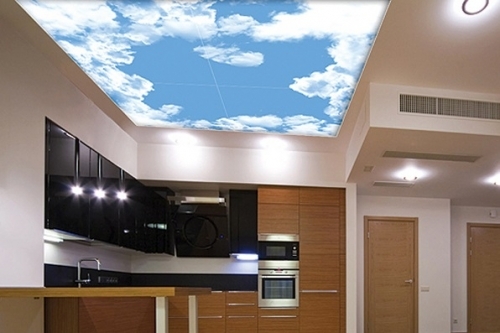 Stained-glass false ceilings not difficult to install with your own hands. And so .. let's get started! 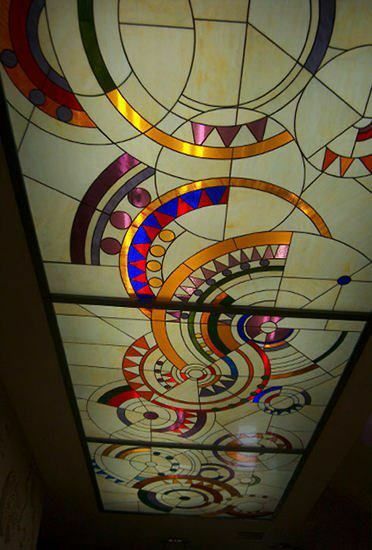 Installation of stained glass panels in a false ceiling design. This method is the most common. The niche of the frame must be at least 15 centimeters in order to be able to fix the glass slabs of the stained glass windows and to organize the lighting. Installation of stained glass without the need for false ceiling designs. 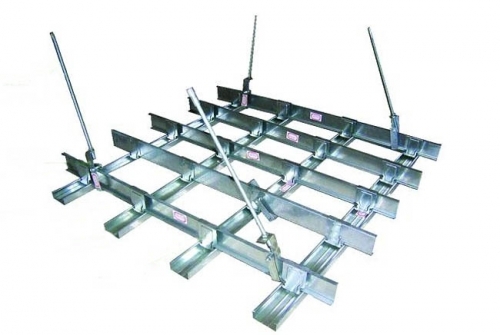 This method implies that the fastening will be carried out on the decorative ledge below the level of the rough ceiling. Installation of stained glass in the form of a "box". This method of fixing is used in case it is necessary to fix the stained-glass ceiling in the form of a large lamp - a box. Since the first method of fastening is the most common, let's consider it in more detail. 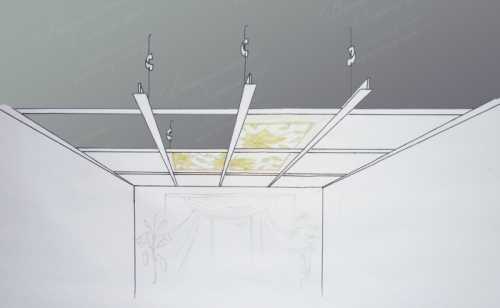 For the installation of stained-glass panels on a modern false ceiling design, you must first design a metal frame around the perimeter of the base of the stained-glass windows. To do this, the ceiling must be parallel to the axes of the frame at a distance of 60 centimeters to mark the points for suspensions. In the places of marks, holes are drilled and steel anchors up to 20 centimeters long are mounted for further installation of the suspensions. For fastening, approximately 8-10 bolts are used, taking into account the mass of the stained glass the design must have a certain excessive strength. Next, we fix the main profiles in the guides and to the suspensions, after which we bend them. Now it is necessary to attach the secondary profiles to the main profiles in the places where the glass layers will be joined in the future. Thus, a metal grid appears, which is a one-level frame. Mount the frame is strictly according to the level, as this eliminates the possibility of falling out of the glass. To do this, you can use a cord or fishing line. 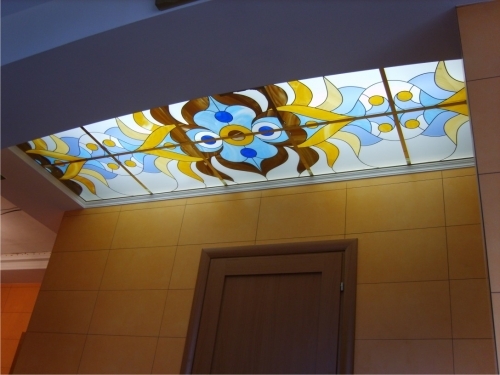 Since the frame is used for the installation of the stained-glass ceiling, therefore there is no need to carry out preparatory work with the base. Also, you need not forget about the layout for communication and air conditioning systems, this will eliminate the possibility of overheating and short circuit. After the preparatory stage of the work is done and the lighting takes its place in the niche, it is necessary to proceed directly to the installation of the stained glass panels with the help of the level along the perimeter. Glass plates are fixed in the frame cell with the help of self-tapping screws. 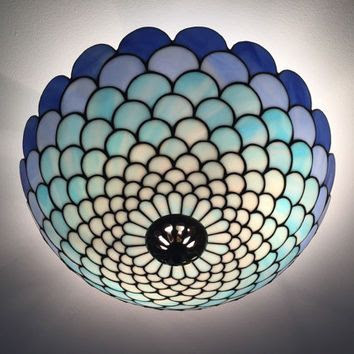 Do not forget that the individual elements of the stained-glass ceiling must be made detachable for further maintenance of the lighting fixtures. 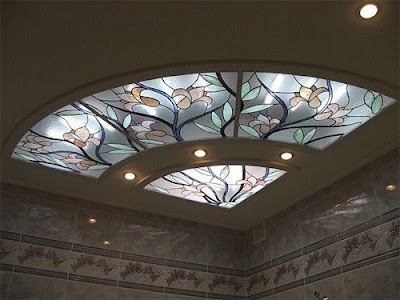 If you want, you can prepare the stained-glass layers yourself, but if you have never encountered glass firing, then it's best to buy ready-made stained-glass windows and then make a frame under their size. 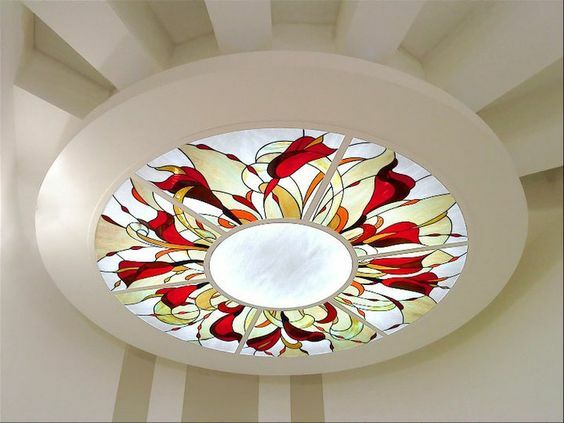 The cost of stained glass false ceilings directly depends on the area and complexity of the installation, with installation works amounting to about 15-30% of the total cost. Of course, the simpler the design, the less it costs. With properly planned lighting, the light passing through the glass panels will create a special unique atmosphere in the room. There are several ways to create a stained glass ceiling lighting. For example, you can place light sources from the inside along the contour of the stained glass window or a spotlight in the middle of it. But the stained-glass ceiling will most effectively look if its entire surface is shining. For this purpose, you can use fluorescent lamps or neon tubes, but today the most relevant is the illumination of ceiling LEd lights. It has many advantages: it is easy to install, takes up a minimum amount of space, has a long service life (within 10 years), it is possible to adjust the brightness and, if necessary, the color of the backlight. 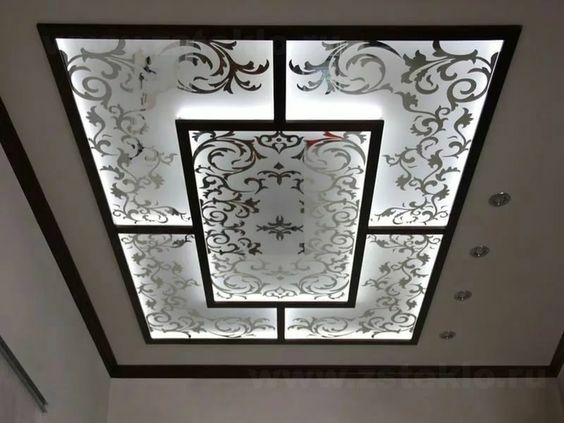 For installation of this LED ceiling lighting, the minimum distance from the stained glass window to the ceiling should be 7 centimeters, and the most optimal - 10-15 centimeters. The LED tape is attached to the surface of the stained glass window in parallel rows at the same distance as from the stained glass window to the ceiling (7-15 centimeters). Basically, the stained-glass window is not used as a single source of illumination, as the light, passing through glass plates, loses its saturation. Therefore, in a room with a stained-glass ceiling there are also additional lighting devices, especially this is important when decorating shopping centers, where lighting plays a major role.